Sierra For All Your Disability & Employment Needs! "Our services cover every aspect of training, recruiting, accommodating, placing and employing people with disabilities," Janet Fiore, CEO. From school age children to adults Sierra consultants assist individuals in vocational training in Philadelphia, as well as efforts to gain access to technology and strategies to meet their personal workplace, educational, and independence goals. All initiatives allow for a workforce that is fully inclusive of employees with disabling conditions. For businesses looking to enhance their corporate diversity Sierra offers training and consulting services as well a situation specific assessment, recruiting and accommodation work. Sierra's diverse team of professionals includes individuals with disabilities. Sierra's accessibility compliance & diversity services assist individuals and organizations interested in vocational training and vocational rehabilitation. Our team of qualified engineers, trainers, technologists, ergonomists, project managers and CRC's direct the following array of services for our customers and clients. Gaps in vocational history automatically trigger red flags for HR personnel, quickly lowering the likelihood that your resume will make the cut. Businesses are using more electronic resume filters then ever before. Often, job seekers with disabilities have employment gaps which cause them to lose their competitive relevance. This makes it difficult for these job seekers to get their resumes past electronic ‘gate keepers'. If you can't be seen, you'll never get the interview. What is iSearch? A professional resume rewrite designed for the electronic world. It is a fixed price service that provides your job seeker with a modern, competitive resume and profile for electronic and traditional job search efforts. E-Mail us for more information on how iSearch can benefit you or your job-seeker. By thinking integrated performance in all aspects of service provision, Sierra solutions reduce discomfort, improve accessibility, promote ADA compliance, and help to create systems for optimal and diverse human interactions in educational and workplace settings. We at Sierra Group view our work with our partners and clients as a virtuous circle of insight, impact, and trust. Our immersion in the field of disability and accommodation, allows us to strive to generate deep insight into what drives value creation and competitive advantage in our clients' businesses and the economy as a whole. Once these insights are uncovered, we work closely with clients to convert them into strategies, whose implementation will have a substantial impact on performance. Delivering impact earns the trust that is the foundation of lasting relationships. These relationships then serve as the forum for still deeper insights and more significant impact. We work to achieve these goals while inspiring creativity and imagination within our client organizations. Sierra serves as a national sourcing agent that can locate and submit candidates and veterans with disabilities to your organization. The number of job seekers is always rising, which leads to increased difficulty for businesses to sift through the stockpiles of resumes for the perfect match. Even with the invention of resume posting websites, the job for HR is still daunting, while losing the personal touch that is often times necessary. This is where The Sierra Group comes in. It is our mission to take candidate sourcing a step further through outreach and education, while never missing that needed personal touch. There are a lot of benefits for an employer to hire a person with a disability. We know that you can find these incentives on your own, but as a public service, The Sierra Group's foundation has compiled a comprehensive and helpful list of all the incentives available by state. Check it out at www.employmentincentives.org. 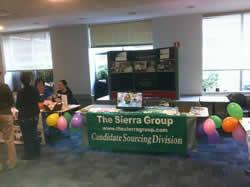 The Sierra Group takes an aggressive approach to learning about each business and candidate personally. We strive to understand exactly what each business is trying to achieve through diverse requirements and locating the most appropriate candidates. Sierra implements a full screening process of each candidate in order to determine if that candidate is beneficial for the organization and then recommend a candidate to the standard hiring practices of each specific organization. Sierra will also meet with the appropriate staff in order to review and discuss the results of the candidate. Once the organization hires the candidate, Sierra will provide ongoing support services for both the new hire and the existing staff members. Sierra has made a commitment to go above and beyond the job of candidate sourcing. Sierra acts as the liaison between your organization and any applicable Federal, State, or Local agencies to request the purchase of necessary adaptive technology, secure the funds for further training, or coordinate job coaching services as may be required to support the employment opportunity, as well as coordinate the delivery of rehabilitation and support services. Sierra will provide ongoing telephone and e-mail support to your organization's staff regarding all areas covered in the previous Team Training and Appreciative Inquiry sessions surrounding the needs of the employee or intern. Sierra will conduct detailed weekly telephone meetings and reviews with new hires and interns to identify the need for employment supports. Sierra will implement and project manage any supports as required. As a diversity recruiting partner, The Sierra Group, attended a resource fair for People with Disabilities at Tiffany & Co. on October 13,2011. United Collection Bureau, Inc. (UCB, Inc.) Ohio Employer of the Year for Hiring People with Disabilities! Jeff Horner, of Candidate Sourcing Partner United Collection Bureau, Inc. (UCB, Inc.), recognized as a leader and “Difference Maker” in his industry, by their national trade publication! The trade magazine Collections & Credit Risk, has a 15-year tradition of honoring outstanding industry performers. In their October/November 2009 issue, they presented their "Leading Lights: Industry Champions" to recognize individuals who have fought to improve Barefield in a meaningful way. Jeff Horner, of UCB, Inc., a Sierra Group Candidate Sourcing Partner, was recognized as one of these "Leading Lights." UCB, Inc. recently received recognition as "Ohio Employer of the Year" for their work in hiring people with disabilities. Read the cover story article, "The Difference Makers" in PDF format - 6.7 mb. Need expert consultation or vocational training services? Professional recruiting or accommodation services? 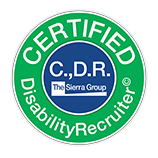 The Sierra Group, Inc. is a national leader in candidate sourcing, workforce strategy, and vocational rehabilitation services. Visit us to request information on retaining the expertise you need. INTERESTED in our services or providing volunteer work? Please contact The Sierra Group via e-mail info@thesierragroup.com or by phone at 1.800.973.7687.